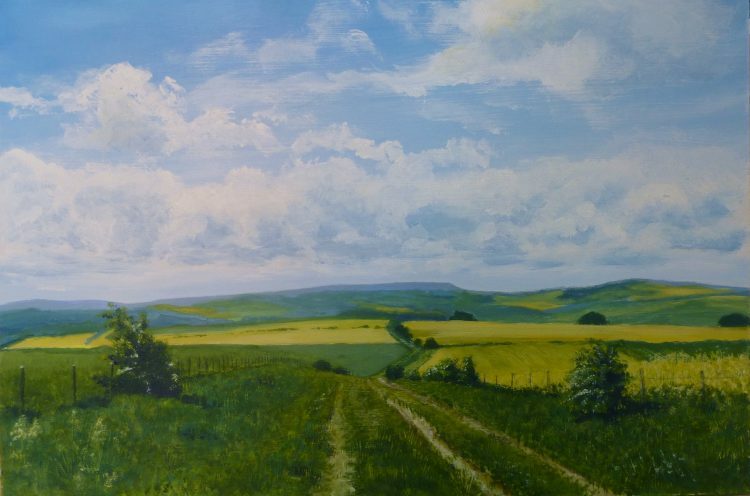 Up on the gallery page this morning – The Ridgeway III! This view is from near Fyfield Down, looking south back towards the start of the Ridgeway at Overton Hill. It was the first morning of my walk. The track is very wide here, with a number of pathways worn into the grass. At this particular spot there were only three – the right hand two being made, I think, by quad bikes which are allowed in summer time. Further up the hill there were five or six different pathways, some of them worn deep into the chalk, some just flattened into the grass. The chalky tracks were full of flints which were very bluish in colour, unlike the flints round here in north east Essex, which are black or a dark graphite grey.